Initial Descent Sitrep T-5 — Ti5, 20ATM & MORE | Redux & Co.
#COURGcrew, this is your navigator from the flight deck. We’re beginning our initial descent into the COURG departure gate vicinity. Keep your seat belts fastened and push your seats back as far as they can go. We know that you could have backed another campaign so we appreciate that you’ve chosen to join us and the Redux crew for our mission. So sit back, relax, and enjoy the remainder of the ride. Thank you everyone for jumping in the Redux hangar to get your hands dirty and kick it with us in the workshop. We’ve hit critical mass in the surveys and I’ve gone ahead and begun the final drawings for the 5 dial and hand combinations that will embark for full production. I will do my very best to have those drawings to debrief with you by Monday. As with any creative endeavor, I think some of you have tasted the peaks and troughs of crafting something extraordinary. There’s moments of inspiration, followed by murky uncertainty, seemingly insurmountable despair, and then a spark of inspiration, and if all goes well, a surprise of joy when you step back and realize: It is good, and the journey was worth every moment. Now imagine stretching those 20-some days into a year and a half! It’s hard to believe that we only have a few days left in the campaign. So here’s our sitrep T-5. I know some of you are disappointed that we didn’t have a clear outline of how the stretch goals would unfold. Some journeys can’t be mapped exactly, and that’s called adventure. Sincerely, as your navigator for this flight, I have to tell you that plotting the course for stretch goals was no easy task. I apologize if the turbulence along the way has made any of you queasy. I feel like I can’t say this enough: When I designed COURG, premium components such as titanium, automatic movement, sapphire, anti-reflective coating, and multiple variants were not nice-to-haves — they were mission critical. Perhaps we could have spaced those out so we could have a tidy veneer of stretch goals, but let’s be honest — that’s just silly shenanigans. STWRD Crucially, thank the good Lord we’ve secured a steward with 10 years watch manufacturing experience through family referrals with deep manufacturing experience who will check in with personal visits on a regular basis throughout the production process to ensure manufacturing quality and timelines. SPPLY I’m firming up supply chain details such as post-campaign backer surveys and fulfillment center logistics. TTNM5 Many of you have waited patiently as we’ve maneuvered to find the optimal trajectory for case material choice. It’s clear we will not reach altitude for our last stretch goal of orienting the entire flight to titanium grade 5. So I’m diverting those plans so that we all have more clarity going into the last few days here. I had extensive discussions with our manufacturer and based on the survey results I’m confident enough (please come through!) that we have critical mass to add titanium grade 5 as an add-on with the understanding that there will be an additional buffer time of 15 days or so. Both Ti2 and Ti5 will have a bead-blast finish. Again, this is an adventure, so until we receive production prototypes of both, I have no images to show. And no, we will not be able to wait until we receive production samples to decide. However, the original price quote was based on the full order of 1,800+ watches. Understand that many backers are completely satisfied with the original Ti2 specs, and some in fact prefer the original. I know we all respect that. If we’re to make this happen, the titanium grade 5 stretch is $25 for EACH COURG you’ve reserved. And yes, go ahead and add that amount to your pledge NOW. THIS ADD-ON preference will be captured AT THE END OF THE CAMPAIGN through a final backer survey. 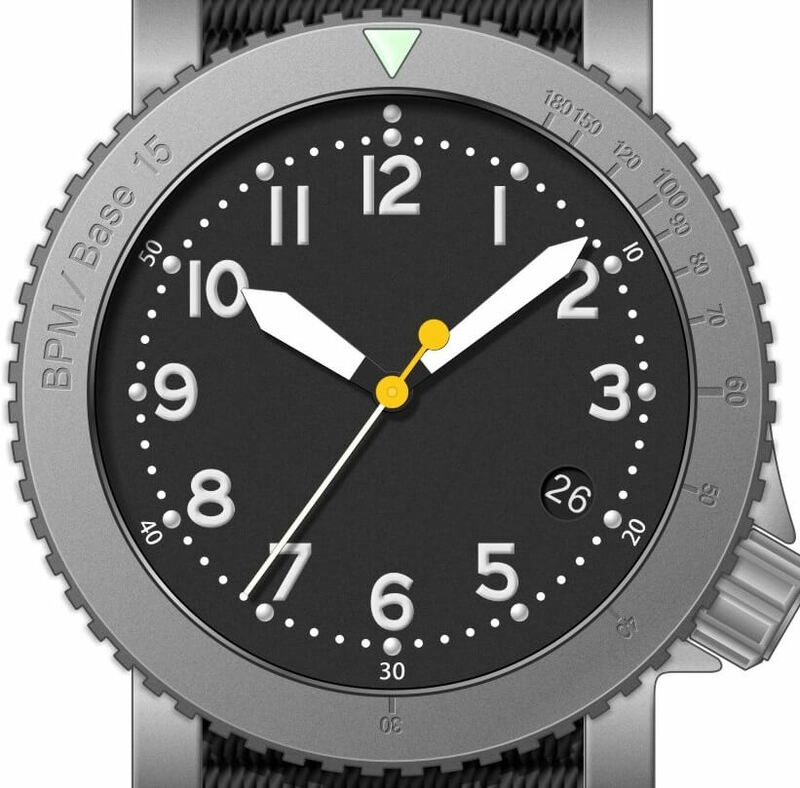 Before anyone asks, this is nothing like a 42mm upgrade, which would require an entire design overhaul. Meet a surprised 39mm convert. Here’s a self-described big wrister saying, “Oh! This works. This really works.” That’s his 41.5 mm for reference. Ahem. Presence. Who dominates? Just saying. 20ATM With that out of the way, I’m happy to announce that we’ve upgraded every COURG to 20ATM as of $500k! 3. Add-on: Made in NYC Horween/Chromexel leather single piece pass through with matte hardware. This was just to take a look at various colors and leather types. These 3 made the cut for us to choose one! MSSGS And of course, doing my best to keep up with comments, messages, and emails, which often feels like a futile effort but that doesn’t mean I’m not glad to hear from you all. I’m taking a very much needed hiatus the next couple days to recharge after only a couple hours sleep each night this week, so thank you for understanding a little radio silence. I hope you’ll enjoy a little refreshing stillness this weekend wherever you are with loved ones! Tackle your mission and Godspeed. elbert, over and out. ← Join the Redux Design Hangar NOW. Surveys inside!